Back home I would have it like this if eating out but, at home, duck was only used to make the most delicious baked rice. But I don’t dare trying to do it myself as it is one of my mum’s specialties 🙂 and I want it to be one of the things I’m looking forward when I visit home. So one day I saw these really nice looking duck breasts at the supermarket and I though I should at least try 🙂 But I had no clue where to start as I always heard it was hard to get it right. And I was scared to over cook it which apparently is so easy to happen. In a saucepan, place the butter and saute the onion and garlic. Then add the rice, mix well and let fry for a few minutes. Add the wine, reduce the heat and keep stirring until all the wine is absorbed by the rice. Start adding the orange "broth", adding more only when the rice has absorbed the broth you added previously. When the rice is cooked and creamy, add the Parmesan cheese and orange juice. Stir well and let it stand for 1 minute before serving. 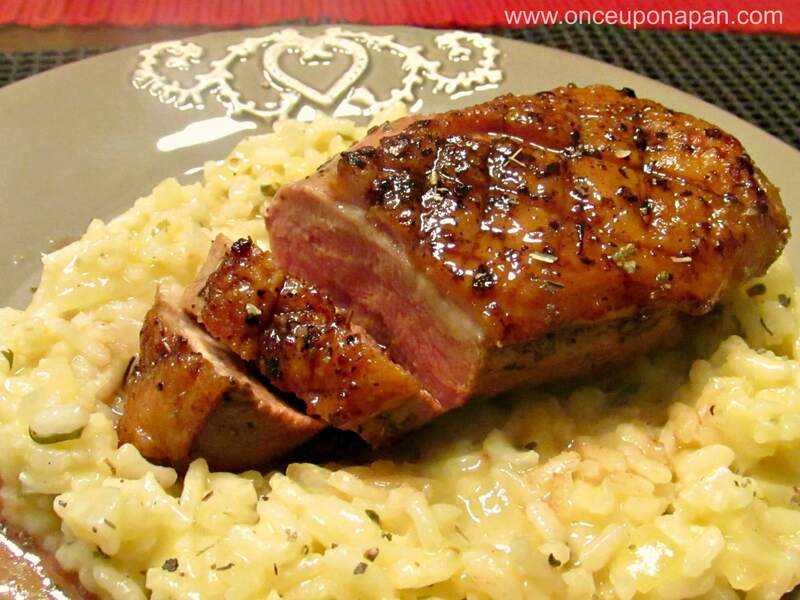 With a sharp knife, score the fat of each duck breast into a cross-hatch pattern. Rub salt and pepper making sure you season all the meat. Heat a heavy based ovenproof frying pan (if you do not have an ovenproof pan, just use a normal one and later transfer the meat to a baking tray). Do not add oil to the pan. Place the duck breasts skin-side down in the hot pan. Cook until most of the fat has run out into the pan and the skin is golden. Place the pan in the oven to finish to your liking. I prefer mine medium-rare so I left it in the oven for about 10 min. Remove the duck from the oven and allow it to rest for 5 minutes covered with aluminum foil. Serve sliced, on top of the risotto, drizzled with the sauce.